Filthy DB Schenker class 66 diesel locomotive No.66192 with the early morning Margam to Round Oak loaded steel train (headcode No.6M81) passes non-stop through platform one at Worcester Shrub Hill Station on a very cold day 22nd February 2013. Photograph taken by Andrew Smith using a Nikon Coolpix 2700 camera set to 1/250th second at F3.8 on ISO160. After a lengthy break the Lackenby to Margam loaded coke trains and their return empties resumed working in February 2013. 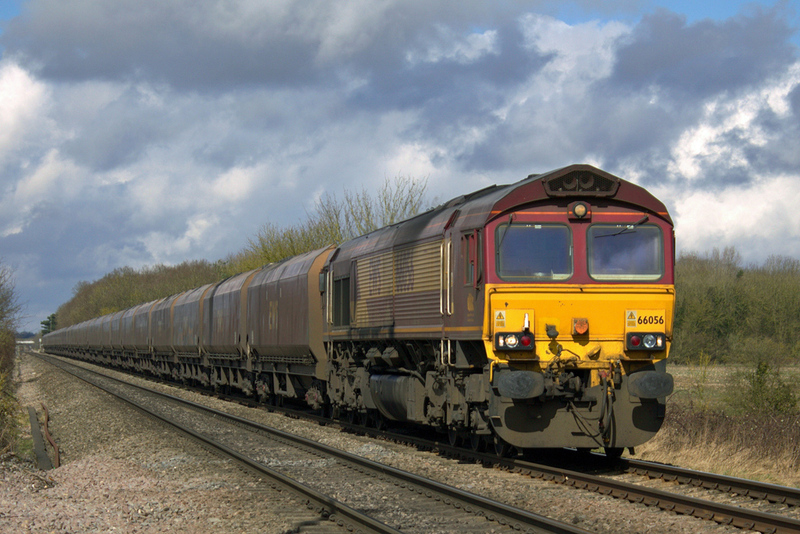 The length of the train is amply demonstrated in this superb view of class 66 diesel locomotive Mo.66056 (Headcode No.6V67) at Pirton on 16th March 2013. Photograph taken by Phil Blann. 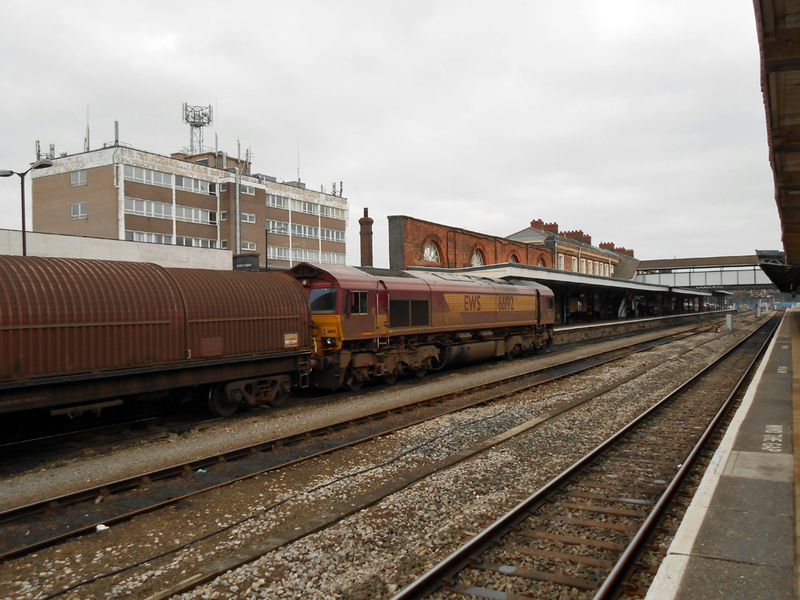 On Saturday 29th June 2013 freight trains were diverted from the North and West line through Hereford to run instead via Gloucester. Robert Pritchard took the photograph (above) of Colas livery class 56 diesel locomotive No.56302 at Bredicot. with the 07.13 train from Chirk to Baglan Bay, and Andrew Lambert photographed the same train at Bromsgrove (below). In 2013, Hinckley Point 'B' Power Station in Somerset continued to be serviced by weekly regular trains to and from Crewe (and thence Sellafield). 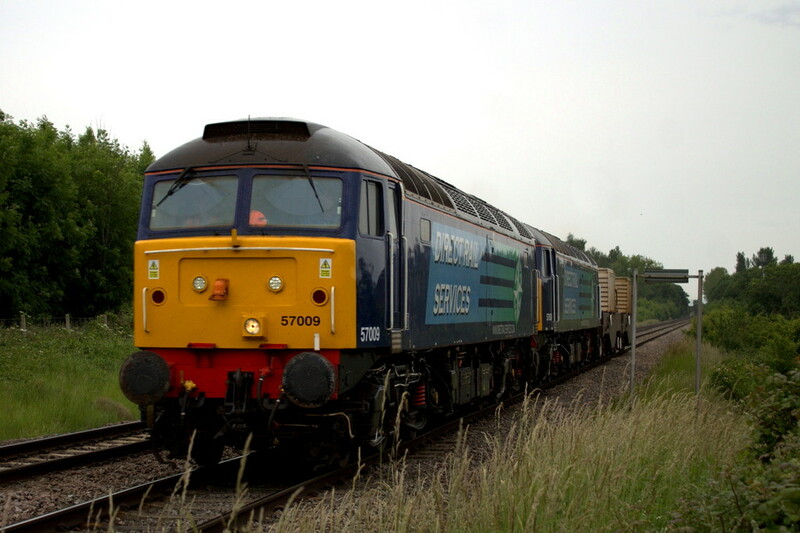 Phil Blann was at Pirton on 27th June 2013 when the weekly northbound train (headcode No.6M63) had class 57 diesel locomotives Nos.57009 and 57008 in charge of two flasks. 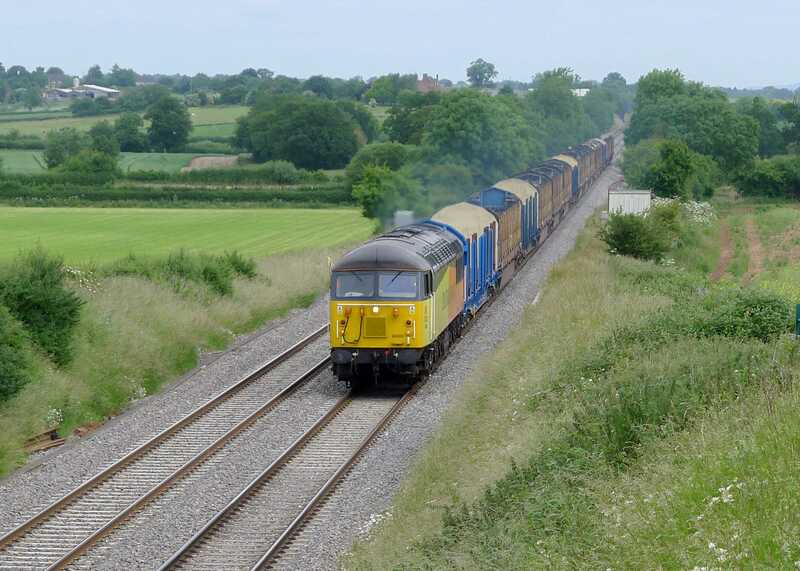 On Sunday 21st July 2013 Robert Cooke was in the right place at the right time at Defford to see GBRf class 66 diesel locomotive No.66736 'Wolverhampton Wanderers' on the 14.57 Cardiff Docks to Peterborough GBRf greenenergy tanks (headcode No.6E12). Just love the asparagus on the right and the hay cropped that afternoon. 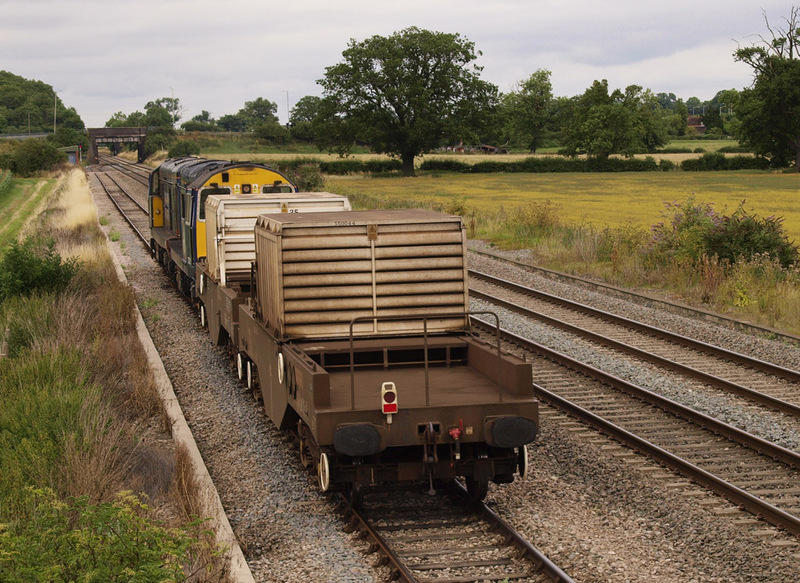 Class 20 diesel locomotives Nos.20302 and 20312 return a pair of nuclear waste flasks from Bridgwater to Crewe for transit to Sellafield. 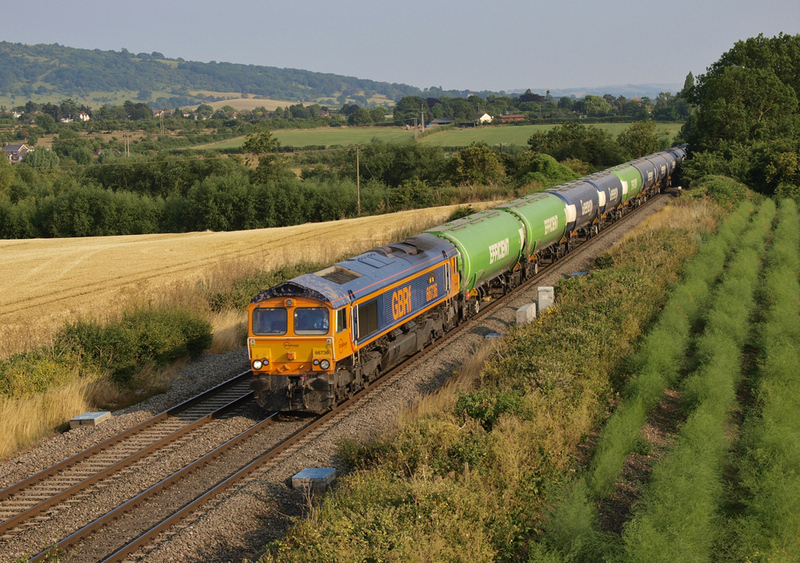 Photograph taken at Spetchley on Wednesday 11th August 2013 by Robert Cooke.